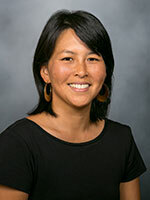 ​Catherine Lee, PhD, is a biostatistician (research scientist) at the Kaiser Permanente Northern California Division of Research. Her methodological research focuses on the analysis of time-to-event outcomes. She has developed methods for relating sparsely collected time-varying biomarkers of Alzheimer's disease to disease progression, and modeled transplant rejection among leukemia patients who have undergone stem cell transplantation. Dr. Lee's current research includes the development of methods for joint risk prediction using semi-competing risks data. She received a PhD in mathematics from University of California, Los Angeles, and a PhD in biostatistics from Harvard University. J Endocr Soc. 2018 Oct 01;2(10):1158-1169. Epub 2018-09-13. ​Intensive residential treatment for severe obsessive-compulsive disorder: characterizing treatment course and predictors of response. ​J Psychiatr Res. 2014 Sep;56:98-105. doi: 10.1016/j.jpsychires.2014.05.008. Epub 2014 May 23. ​Plasma signaling proteins in persons at genetic risk for Alzheimer disease: influence of APOE genotype. ​Arch Neurol. 2012 Jun;69(6):757-64. doi: 10.1001/archneurol.2012.277. ​Neurobiol Aging. 2013 Jan;34(1):62-72. doi: 10.1016/j.neurobiolaging.2012.03.006. Epub 2012 Apr 13. ​Single-institution, multidisciplinary experience with surgical resection of primary chest wall sarcomas. ​J Thorac Oncol. 2012 Mar;7(3):552-8. doi: 10.1097/JTO.0b013e31824176df. ​Schizophr Res. 2011 Mar;126(1-3):124-31. doi: 10.1016/j.schres.2010.11.008. Epub 2010 Dec 14.